I’ve found that people who ride bikes are generally the type of people who think for themselves. In a way, that’s evidenced by the act of bike riding itself. And being that kind of a free-thinker is sometimes coupled with not wanting to follow rules set up by other people. This desire to not follow rules most frequently comes from either resentment about being told what to do, the libertarian ethic, or just the urge to oppose anything that the majority of people seem to mindlessly go along with. But thinking for one’s self and following rules are not necessarily incompatible. And when riding a bike, whether it’s on a road or trail or anywhere else, following rules can help keep you and those around you safe. And in large part, your safety when you’re riding depends on you. The following is a list of rules which I’ve compiled over the years. But, if it makes you feel better, you may consider the following as suggestions or guidelines instead of rules. Every ride starts with your bike, so know your bike. Know its capabilities and limitations. The right kind of bike is the kind you’ll ride, whether it’s an upright or recumbent, a hybrid, a road bike, a trike, a mountain bike, a penny farthing, a tandem, or anything else. And by the way, monogamy is not required in this regard. Riding a variety of different bikes is okay too. Mixing in different types of riding can keep you mentally fresh, boost your skills, and help remind you that riding is fun. Consider getting professionally fit to your bike. Your ideal position will change over time, so you may want to do this periodically. As you get older like me you should consider a professional bike fit every few years. As a general rule, if your knee hurts in the front, raise your saddle; if it hurts in the back, lower the seat. Check your bike and other equipment before you begin a ride. Check that your tires have sufficient air, the brakes are working properly, the chain is lubricated and runs smoothly, and any quick release levers are closed. Here are some basic guidelines when checking your tire pressure. If you weigh more than 180 pounds, inflate to the maximum on the tire sidewall. If you weigh 110 or less, fill to the minimum. Somewhere in between? Inflate to somewhere in between. Mountain Bike: Target somewhere between 27 and 32 psi for most tires. Ultraskinny XC tires may require as much as 35 psi. Figure on 20 to 30 psi for tubeless tires. Speaking of Your Chain. . . A well-maintained and lubricated chain could last 3,000 road miles or more, but check it every 500. Here’s how: Take a ruler and place the 0 at the rivet of one link. If the ruler’s 12-inch mark aligns closely with another rivet, you’re in good shape. If it’s more than a 1/16th of an inch away, replace the chain. Wear a helmet that meets approved standards and be securely fastened. I know there are some who would advocate for not wearing a helmet, claiming that there is no consensus that wearing a helmet is safer. However, I personally have been involved in accidents in which wearing a helmet prevented me from being hurt worse that I was. And I have never heard anyone contend they were hurt because they wore a helmet. Dress for success. Layer Like a Wedding Cake – Easily removable layers make it a snap to regulate your temperature. Booties, vests, and skullcaps, as well as arm, knee, and leg warmers, can all be stashed in pockets as the day warms up. Carry tools and supplies that are appropriate for your ride. This may include a patch kit/bike tube(s), tire levers and an air pump for changing a flat tire. And know how to change it if you get a flat. Eventually, you probably will. Carry a frame pump. And a multi-tool with a chain breaker. Clean your shoes monthly. Also wash your gloves. Always take a little money, a cell phone, and identification with you too. And have emergency contact information with you which is easily accessible to others, especially if you’re riding alone. Money can’t buy love, but it can buy food, water, a phone call, or a spare tube. can serve as payment for a borrowed tube, a tip for your mechanic, or a way to celebrate another great ride. Use cycle lights and reflectors when visibility is poor not only at night when it’s dark out, but at any time from dusk through dawn. You should use a white or green light in steady mode visible from five hundred feet to the front, and a red, amber or blue blinking light visible from five hundred feet to the rear. Also consider attaching a small light to your helmet, jersey or seat post. During daylight hours, be conspicuous by wearing bright colors or something with high visibility. Make eye contact with others around you. If you are riding with panniers or a load need to be secure must not touch the ground and mustn’t extend more than one metre out in front of or behind the wheels, or more than half meter on either side. Set Your Suspension—And Check It Often – It’s frightening how many riders hit the trail with poorly adjusted forks and shocks. Not only will droopy suspension make your bike feel like a wet noodle, it can also be downright dangerous. Here are some general guidelines, but be sure to read the manufacturer’s recommendations (found online or in your owner’s manual) because they will provide the starting point based on your bike’s suspension design. And because air can leak through the seals, remember to check your pressure monthly. A few simple adjustments are all it takes to have your suspension smoothly sucking up bumps. (How much the suspension compresses when you sit on the bike) Compression (Controls the rate at which the suspension compresses in response to a bump) Rebound (The rate at which the suspension returns to full extension) For XC: 20–25% of travel. For trail: 25–30% of travel For DH: 30–35% of travel. Start with the dial in the middle setting, and go ride. If the bike feels harsh, dial the damping down a click. If it feels mushy, add a click. Repeat until it feels smooth and supple. Again, start in the middle setting. Ride a short, rough section of trail. If the fork or shock seems too springy, add a click of rebound. If it bounces back too slowly, dial it back a click. Check the weather, but don’t let it deter you. Embrace the Rain – Unless you live in the desert, soggy rides are a part of life. Just dress appropriately: Layers and a rain jacket are optional in the summer, but become essential when temperatures start to drop. Pick a smart route. Whenever possible, ride on roadways with a shoulder, lighter traffic, bike lanes, or other safety features for cyclists. Often the most direct route isn’t the safest one. If you need some guidance, ask your local bike shop, or find routes on digital tools like Google Maps, or apps like Strava or MapMyRide. Have You Outgrown Trails – Trails have engineering and design limits. If your speed or style endangers other users, check for alternative routes better suited to your needs. Selecting the right location is safer and more enjoyable for all concerned. Make sure you have enough fuel. Eat Real Food On longer rides, easily digestible calories are key—and they shouldn’t come from just energy bars. Warming up at the beginning of a ride is important, so a slow start primes your engine by directing oxygen from your blood cells to your muscles. Spin easy for 20 to 30 minutes before you begin to hammer. In general, bike riders have the same rights and responsibilities as drivers. Obey all road signs and signals. Stay alert and always Exercise Due Care And Caution. Give way at pedestrian crossings and yield at intersections. Be predictable by riding in a consistent and predictable manner. Always look behind before changing lanes or positions. Communicate and make your intentions clear to everyone on the road. Ride in a straight line and don’t swerve between parked cars. Signal turns, and check behind you well before turning or changing lanes. Use hand signals to show other road users what you are doing. Communicate. Make eye contact with drivers and use hand signals and other gestures to let them know your intentions. Indicate turns or lane changes by pointing and be sure drivers’ actions. 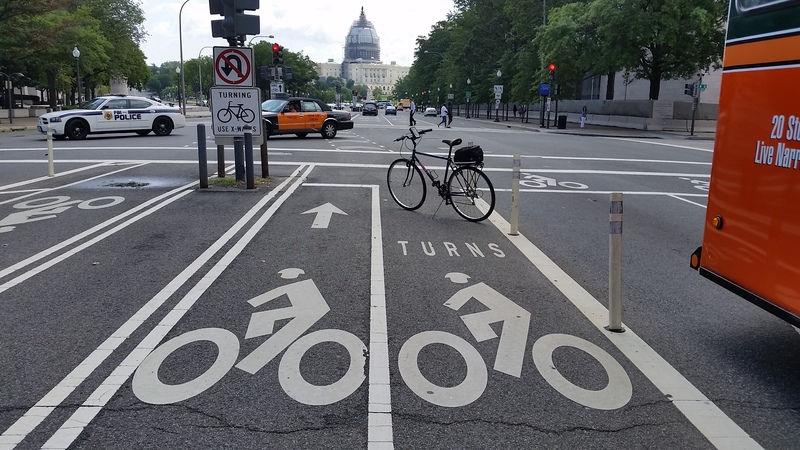 Think ahead and try to anticipate what drivers, pedestrians, and other bike riders will do next. Watch for turning vehicles and ride outside the door zone of parked cars. Look out for debris, potholes, and other road hazards. Cross railroad tracks at right angles and approach other obstacles in a way that avoids trapping and approach other obstacles in a way that avoids trapping our wheel. Keep Your Perspective – On the road, think like a motorist. Maybe there’s a reason the guy in the pickup truck was pissed at you. Expect the unexpected. Listen for cars behind you, watch for brake lights in front of you (it could mean a car is turning). Look for people pulling out of driveways, or someone opening a door in your path—though the simplest solution to avoid getting “doored” is to ride at least 3 feet from parked cars. And the right hook In this common scenario, a car passes you and immediately makes a right turn in front of you. While it’s difficult to avoid, brake lights can often give you valuable advance warning. Look for them. Quickly stopping or turning right may also allow you to avoid a collision. Beware the left cross… Be vigilant for cars approaching from the opposite direction that abruptly turn left and cut you off in an intersection. It’s easiest to slow down to let the car pass in front travel parallel to the vehicle. Similarly, when riding on a trail, assume walkers, joggers, and anyone else ahead of you has an iPod and is wearing earbuds, and could suddenly and unexpectedly change direction and move into your path. Ride with traffic; use the rightmost lane headed in the direction you are going. Always ride as near as you can to the right side of the road, or the left side. If you are holding back traffic you must move as far as possible to the left side of the road to allow traffic to pass, as soon as you can. However, you do need to cycle in a sensible position on the road to keep safe. Keep Right – Stay as near to the right side of the trail as is safe, except when passing another user. Take the Lane – You have a right to the road, so use it. It’s safer than riding on the shoulder, which is often cracked, covered in gravel, or worse. But don’t be a road hog, either. Give Audible Warning BEFORE Passing – Give a clear signal by using voice, bell or horn before passing. Give the person you are passing time to respond. Watch for their reaction. So that you can hear these signals, don’t wear headphones on the trail. Pass Fast – In a mountain-bike race, make your presence known, then pass quickly. And if someone’s passing you, let him or her by. Pass On The Left. – Pass others, going your direction, on their left. YIELD TO SLOWER AND ON-COMING TRAFFIC. Use hand signals to alert those behind you of your moves. Look ahead and back to make sure the lane is clear before you pull out and pass. Pass with ample separation and do not move back to the right until safely past. REMEMBER: KIDS AND PETS CAN BE UNPREDICTABLE. Ride in single file when passing vehicles. To corner, enter wide and exit wide. Wear Out Your Shifters – You have lots of gears for a reason: to keep your cadence in the sweet spot. For silky-smooth gear changes, remember to shift before a punchy climb, sprint, or tight switchback. Brake Less – It sounds counterintuitive, but the harder you yank on the brakes, the less control you have over your bike. The best riders brake well before a corner. Plus, laying off the stoppers forces you to focus on key bike cornering skills such as weight distribution, body position, and line choice. Respect Your Front Brake. Applying 60 percent front brake will bring you to a smooth, controlled stop. But on steep descents or during rapid decelerations, you’ll want to rely even more heavily on the front. When cycling behind other cyclists and vehicles you must be able to stop, keeping clear of the vehicle in front, if it stops suddenly. It is recommended you keep at least two seconds behind. don’t hover in a car’s blind spot. Keep Your Head Up – Looking far down the road or trail will help you see approaching traffic, spot the best line through corners, or recognize when someone’s making a break. Stopping – When stopping, move off of the trail. Beware of others approaching you from behind and make sure they know you are pulling over. It’s Okay to Stop – Don’t be afraid to pull over for a good swimming hole, hot spring, ice-cream stand, cafe, bakery, or dive bar. In fact, some of the best rides are planned around these diversions. Give way to emergency vehicles when their sirens are on or when lights are flashing. It is a good idea to pull over to the curb and stop. Know What The Wind Is Doing – On blustery days, pick a route that heads into the wind first. Then get aero to minimize drag—slide into the drops and bring your elbows and knees tight to your body. In a group, ride in a single-file paceline to slice through headwinds. If the breeze is whipping across the road sideways, form an echelon (an angled paceline created by overlapping your front wheel with the rear wheel of the rider ahead of you) to keep the wind out of your face. Pedal at a higher-than-normal cadence even if it means riding a little slower. Then, turn around and enjoy a tailwind as you speed home. Play the Terrain – Go hard on climbs and take it easy on descents. Listen to Your Bike – “A click or pop or scraping noise doesn’t heal itself,” says Calvin Jones, director of education at Park Tool. Pay attention to the sounds emanating from your ride and you’ll know when it’s time for some TLC. Drink before you are thirsty; eat before you are hungry. Wait to eat and drink until you’re at the back. Don’t park your bike so that it blocks paths or driveways. Clean your bike regularly, especially after a wet or muddy ride. Mist it with a garden hose or soak it using a bucket of soapy water. Wipe it down and rinse, then dry it with a clean rag or towel. And don’t forget to lube your chain afterward. Refuel properly. The key recovery window is the 30 minutes following a ride, when your body needs protein to repair muscles and help replinshes its energy reserves, so make sure to get at least 20 to 25 grams. Don’t Live in Your Chamois. When the shoes come off, your shorts should come off with them. Be Courteous – All trail users, including bicyclists, joggers, walkers, wheelchairs, skateboarders, bladers and skaters, should be respectful of other users regardless of their mode, speed or level of skill. Be Respectful Of Private Property. Trails are open to the public, but often the land on the side of the trail is private property. Please respect all property rights. Clean Up Litter – Do not leave glass, paper, cans, plastic, or any other debris on or near a trail. If you drop something, please remove it immediately. Even if it’s just a short ride. No matter what the excuse—it’s cold, you’re tired, Shark Week is airing on the Discovery Channel—you can always shoehorn in a short ride. Head away from home for 30 minutes. If you’re still miserable, turn around—you’ll have logged an hour on the bike. Or, just keep riding. Keep a Spare Kit in Your Car – You never know when you’ll have the chance to sneak in a ride. Borrowing or renting a bike is easy, but it’s harder to find a spare helmet, shoes, and chamois. Keeping a kit in your car all but ensures you’ll never miss an impromptu ride. Scour bike swaps for secondhand shoes, pedals, and other items, but buy a new helmet—decent models can be found for about $75. Race, At Least Once – It will push you to ride harder than you previously thought possible. Stick with Your Group – Whether you’re embarking on a 500-mile charity ride or racing Paris-Nice, there’s safety in numbers. Teammates and friends can pull if you’re feeling tired, share their food, or help fix a mechanical. Your training needs to have structure, but it should be malleable based on how you’re feeling.